This is a fully closed circuit re-breather originally a Dräger Dolphin but now just called the Dolphin MK 3There are no electronics used to control the mixture on this unit as it is all done using a method called KISS GAS INJECTION. A man by the name of Gordon Smith from Canada brought this type of injection to the masses with the introduction of his KISS Re-breather back in the early eighties. 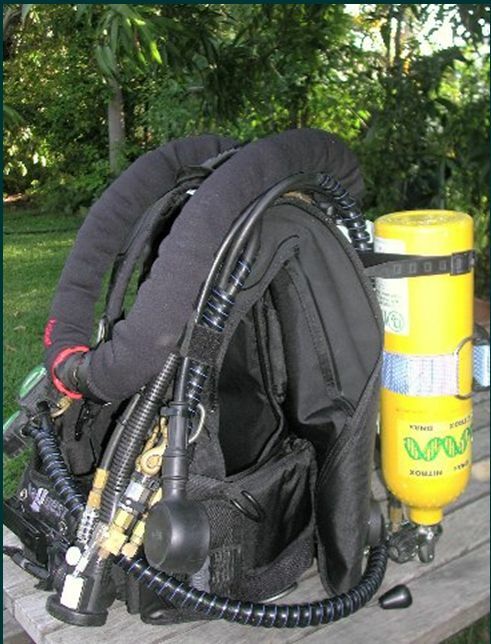 The Dolphin MK 3 Re-breather uses a similar principal as Gordon’s unit with some changes to suit the Dolphin breathing loop and design. Special thanks to Frank Feather who put up with my ideas and machined all of the parts I required, without complaint. He is now the proud owner of a second closed circuit Dolphin as a result of the modifications done to the unit you now see. I had been diving for years and was always looking for something that bit different as I had dived all the popular places around the area and living in Townsville on the edge of the Coral Sea was able to dive in some magical spots. But you know how it is, the grass is always greener somewhere and I was like most other divers I know eager to find that exclusive spot or wait for that next model regulator to hit the shop floor. That was until I discovered rebreathers in 1995 when Peter Ready came to Townsville and changed my thinking completely about diving. 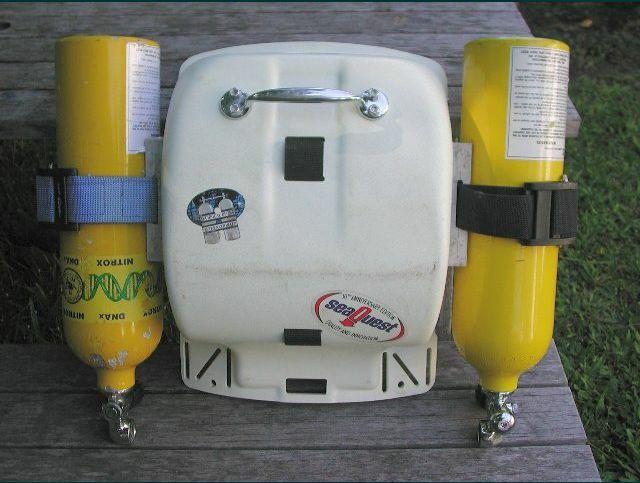 And as a consequence, after much research, seriously looking at the possibility of building a rebreather brought a Dräger Dolphin in September 1998. Being from and engineering background I could see from the start that this unit was a tinkers delight. But little did I realize that this would take me on a 4-year project and radically change the unit from what it was then, to what it is now. I began with a standard package from Dräger, a Dolphin complete with 32,40,50,and 60 percent jets but no cylinder. After many variations of cylinders, valves and other pieces of engineered equipment was not going to solve the problem. Semi closed circuit re-breathers certainly have their place. Clearly the Dolphin was not going to give me the versatility as I had first thought. I found that I could plan an EAN60 mix for the days diving and find the weather would change allowing a trip to the reef. 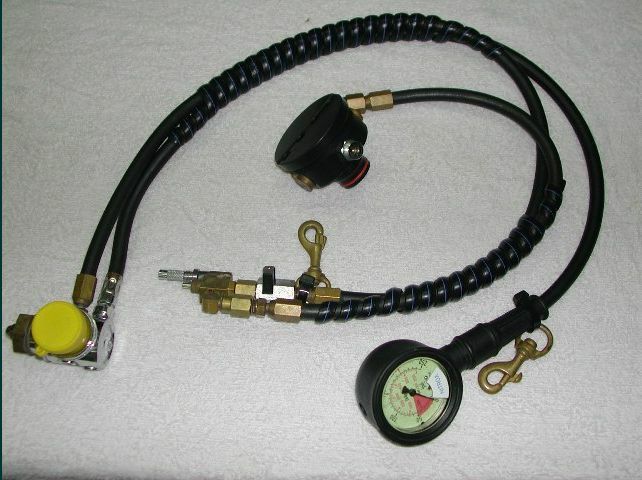 This would change the diving depth and make the gas mixture un-useable beyond certain depths. Or the opposite would occur and I would find myself bleeding off heaps of gas using an EAN32 mix in 10 meters of water. The major problems were gas mixing, and depth flexibility. I knew exactly how long I was able to spend underwater so it didn’t matter if I was an air hog or not, the resultant times would be the same. The tank duration verses the size did not offer the gas savings I thought it would. When you live in a place like Townsville its not so easy to just drop into your local dive store and get a nitrox fill as you can in the larger cities. However I was lucky because we do have a commercial diving facility in town, The Dive Bell. They were able to mix the required nitrox fills for me. I made some changes to the re-breather to allow more flexibility of mix and depth by adding a metering valve between the jets and the first stage regulator. But this only served to prolong the tank duration by limiting the flow of gas to the re-breather, but did nothing to address the ppo2 issues associated with depth and the gas mixes. I dived this configuration for about three months, but realized that no matter what I did I was not going to solve the problems of flexibility, diving depth or gas duration. It was at this point that I decided to bite the bullet and design a modification for my Dolphin to go fully closed circuit. To do this I brought 2x 2.6-liter alloy tanks with din valves 200bar rated. One with a left hand valve and the other with a right so the On/Off knobs were both facing the same direction. I designed and built 2x tank mounts to bolt onto the shell of my Dolphin. 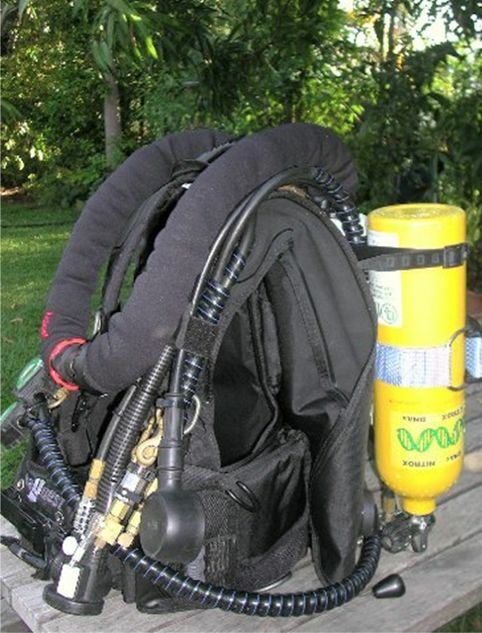 The first ones were stainless steel but later on I used aluminum and shortened scuba tank straps, along with a proper carry handle on the back. The original handle will in time crack your shell. 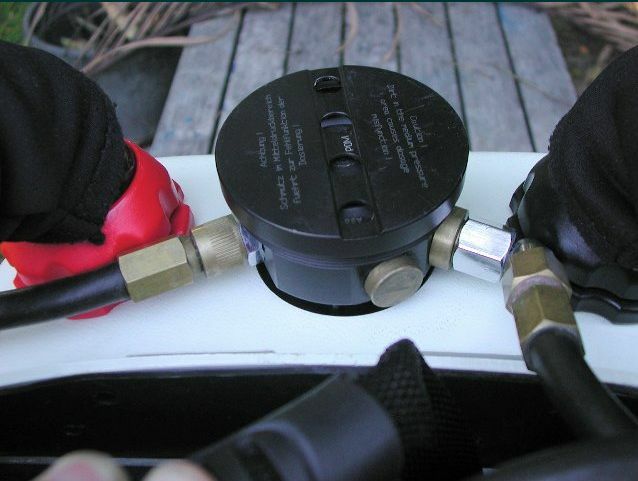 Below is a photo of the shell setup for the two cylinders and the handle that comes in so handy. Next I added 2x Poseidon first stage regulators with din fittings and o2 cleaned both. They were Cyclon 5000 units and I used the first stages only. One for dilutant and the other for 02 and oxygen cleaned one of the cylinders and labeled it accordingly. I then designed the dilutant addition by using the existing demand valve as it was already there so might as well use it.... keep it simple principle. I found that the spring in the bypass valve was designed for 16-bar line pressure and I was using 8.5 bar so it was replaced with the spring from the demand valve of a US divers Conshelf SE regulator and this worked extremely well. I could crack the demand valve with ease no matter how fast or slow I descended. The contents gauge for the dilutant is over the shoulder and clips to the D ring on right hand side of the harness. I also took an air feed from the dilutant first stage and brought the hose over the shoulder and across to the left hand side and used an Air2 as a bailout and for BC inflation. This works very well and has never needed to be changed since. I designed the o2 injection using a Clippard Minimatics two-port upstream valve and o2 cleaned it. To this I added a Swage lock needle valve and instead of using brass fittings to plumb it into the bypass valve, ported it directly through the body of the Clippard valve block. This made for a nice neat package enabling good control of the injection of oxygen into the breathing loop. The needle valve had a flow rate of 0-5 liters per minute and I found that controlling the flow rate of oxygen was very easy. I put this between the Poseidon first stage regulator and the Dosing block. My dive buddy Frank Feather machined a small flow restrictor and plumbed it into the dosing block. The Flow rate at 8.5 bar IP pressure was around 8 liters per minute; this was ample flow for a manual rebreather. It would take approx one minute to fully flush the loop, so I would have plenty of time to fly the rig on the tank valve if for some reason the manual Oxygen addition valve started to leak past the seat. If you look on the left is the automatic dilutant addition, and on the right is the oxygen injection point. Nice and simple backup, remembering to keep it simple. The only thing left to do was plug the hole in the Oxygen regulator so it would have a fixed pressure and not compensate for depth changes. 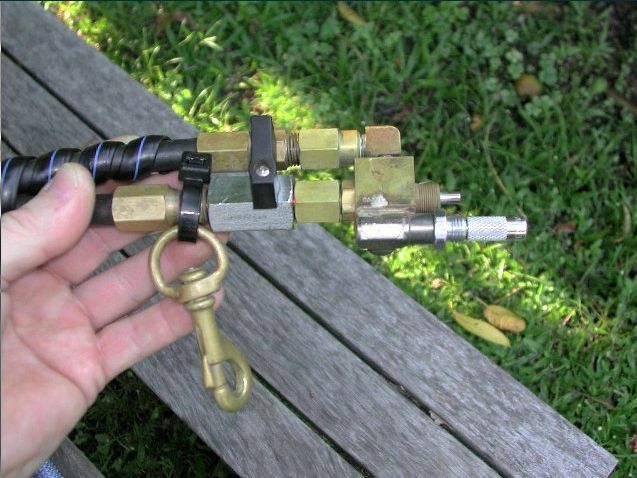 This was achieved by making a simple brass plug to replace the outer cover and works fine. You can see the modified regulator on the right used to deliver oxygen to the breathing loop. Access to the loop is made very easy due to having no BC in the way while trying to do pre-dive checks, also assembly and dismantling is made so much easier. Oxygen contents gauge is over the left shoulder and lies next to the Air2 and is easy to see. Oxygen addition is by needle valve adding just enough to equal the divers inspired metabolic rate and a manual addition or by-pass valve is used to balance the loop Ppo2. After many hours underwater I find that this only needs to be done once or twice over the course of a dive and most dives are usually around 90-120 minutes. Injecting the oxygen into the exhalation side of the loop means it is mixed completely by the time it reaches the breathing bag. As a result of this the ppo2 is “very” stable. Tank duration is 10-12 hours regardless of depth so I can take the rig diving for a weekend and never have to worry about tank fills and of course there is "No Mixing" before hand. I added 2 Dräger Oxy Gauges to the rig and have them programmed to low setting .5 and high setting 1.6 and I dive the rig around .9 - 1.2 most of the time. It is easy to see what is happening with the mix and if you think there might be a problem with one of the sensors it is simple to flush the loop and watch the gauges track as the ppo2 rises, if they don’t track evenly you know you have a problem and can take steps to correct it. 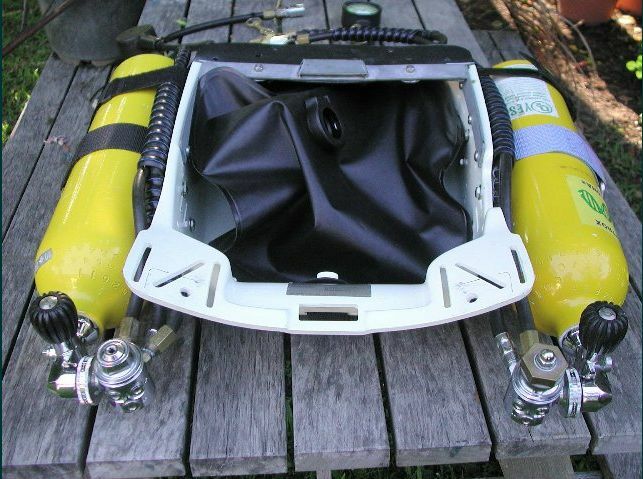 The final modification was to remove the BC from the shell completely and replace it with a Sea Quest Black Diamond Buoyancy compensator. 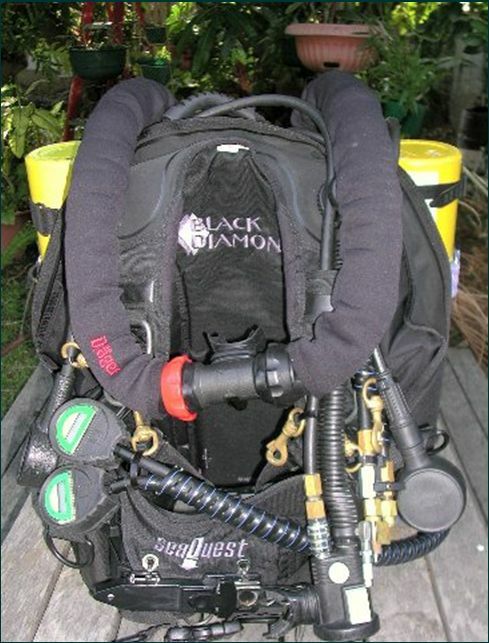 The Black Diamond lends itself so well to a re-breather because of its comfort and positioning of the weight pockets for tank trimming are actually in line with the counter lungs. So balancing the unit was a breeze. With 50 pounds of lift, adding additional tanks for deep wreck dives is not a problem. The original Dolphin BC was struggling to get your head out of the water on the surface and replacing it was a wise move. It is a real pleasure to dive the unit and balance is excellent. The B.C. is attached to the shell by a simple “A” frame and it takes less than 30 seconds to fit or remove, this makes last minute checks in a small boat that much easier. I would recommend this B.C. for the Dolphin Re-breather as nothing else comes close for comfort or balance. This concludes the modifications to the Dolphin MK 3 re-breather and now I am just happy to dive the unit. 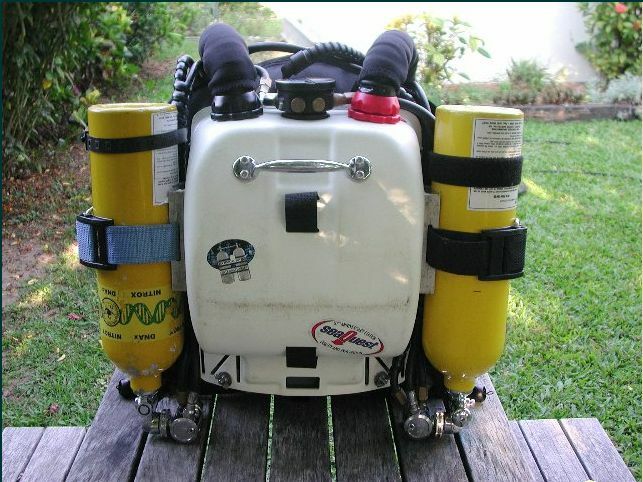 I have well over 100 hours up on this last configuration and the second Dolphin, Franks is identical and behaves and dives the same as this unit. For the last 6 months I have had so much enjoyment from the interaction with marine life especially when diving with a second re-breather and no open circuit divers are about. Now I am seriously thinking of going back into underwater photography, as the fish just take absolutely no notice of you at all. I am now a CCR convert and will never change the unit back to SCR.